One of our final excursions before leaving Florida was a trip to Daytona to tour the International Speedway. Being NASCAR fans, it was a great opportunity to learn about the history of the sport and to actually experience the 31 degree bank! 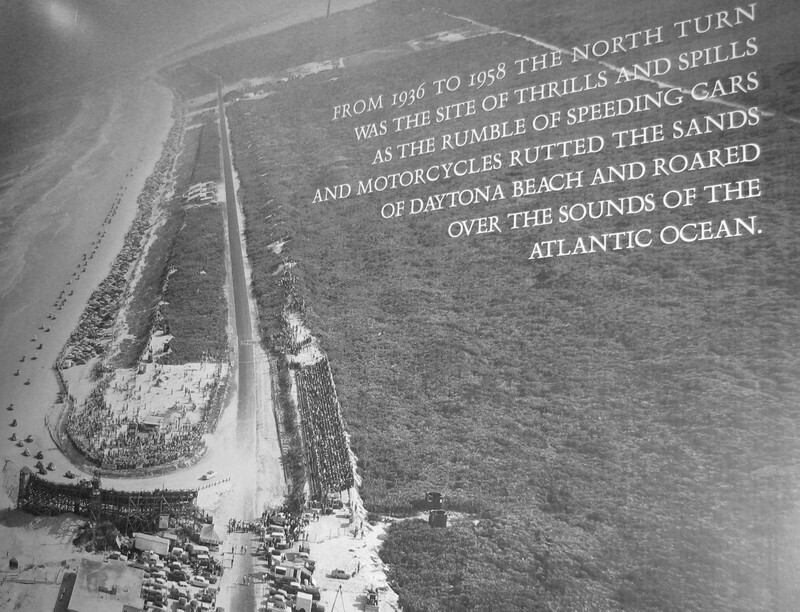 This picture of the Daytona race on the beach in the 1950s was remarkable for the undeveloped area to the right of the beach as seen in this picture! Additional pictures of Daytona and other experiences are in Photo Album: 011: Heading West on I-10. There are so many live oaks, that it’s green all winter. Even when it gets dark early, you can still spend the evening with the door open. You can drive in and out of rain showers within 1 mile. The clouds are puffy, cumulus, and seem like you can touch them. They are rarely steel grey all over like Pittsburgh skies. You can hear birds chirping even in December. Flowers bloom in December…even wild flowers. We try to maintain a four-hour travel day so we allowed 2 1/2 weeks to travel the 2,200-mile, 45-hour drive to Quartzsite. We left Bushnell, Florida on December 28 planning to get to Rainbow Plantation (another Escapee park) in Alabama for the new year's weekend. As we traveled north on I-75, the number of palm trees decreased while we traveled through horse farm country. Watching the changing terrain has been one of the most interesting things we have found about traveling west. We were amazed by the number of pine forests in the panhandle of Florida.Our weekend in south Alabama gave us the opportunity to see the less developed and more accessible beaches of Gulf Shoes and Orange. Even though it was gray and threatening rain, we drove down the peninsula and found large stretches of beach with no houses blocking beach access. There was also quite a bit of property for sale which made us wonder if some homes were destroyed during Hurricane Katrina. Our travels across Louisiana and eastern Texas deserve another trip before forming an opinion. 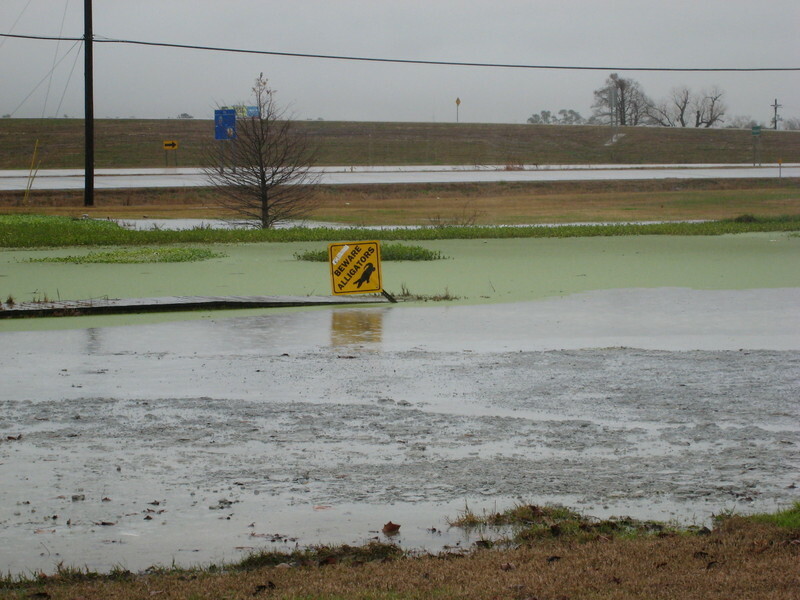 We drove through heavy rain which caused this small pond at our overnight stop to overflow its banks. We spent the weekend in Livingston,TX, at the home base of Escapees. The highlight of our stay was attending a church where teenagers filled the whole front half of the church and took the initiative to stand during worship, to raise their hands in praise, and to be pro-active in moving out of the pews to greet adults during the fellowship portion of the service. It was also the first time we ever saw the minister's wife walk down the aisles shaking people's hands and welcoming them to the service for about 10 minutes before the service. The other thing we appreciated about the service was the opportunity for quiet, personal prayer...lasting more than 20 seconds. At this juncture, we revised our travel schedule several times as the forecast for nighttime temperatures in the teens was predicted across the south. We had planned to stay in Pecos for three days, but we revised our plans to stay only two days so we could move out and get far enough west before the low temperatures hit. 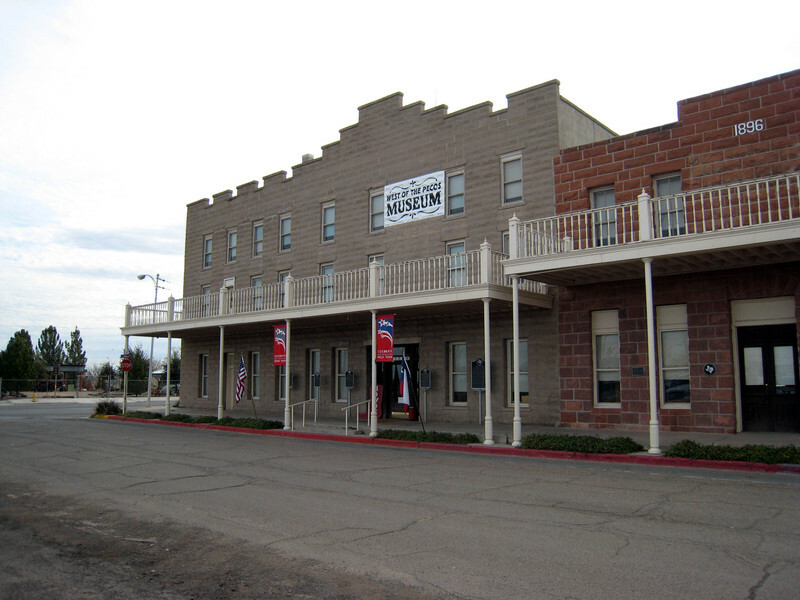 The high point of our stay in Pecos was the West of the Pecos Museum which is housed in a saloon built in 1896, by R. S. Johnson, a former Texas Ranger. The red sandstone building included the saloon on the first floor with bedrooms upstairs. In 1904, the three-story Orient Hotel was added and was in use until the mid-1950s. There were over 50 rooms of exhibits: artifacts, history, and West Texas lore. Additional pictures in the photo album capture some of the notable and quirky displays. Another fascinating thing we learned was the presence of the Permian Sea, a large underground saltwater sea located under the west Texas desert. Water from this sea is pumped to the surface and used to raise "the sweetest, cleanest, best-tasting shrimp." The Permian Sea Shrimp Store is definitely on our list to visit when we pass through Texas another time. Pecos is also known for its cantaloupe. Although the varieties grown in other areas are the same, climate, soil, and cultivation methods account for the distinctiveness of Pecos melons. Pecos cantaloupes first became popular and in wide demand when they were sold to the Texas and Pacific Railroad to serve in their dining cars. 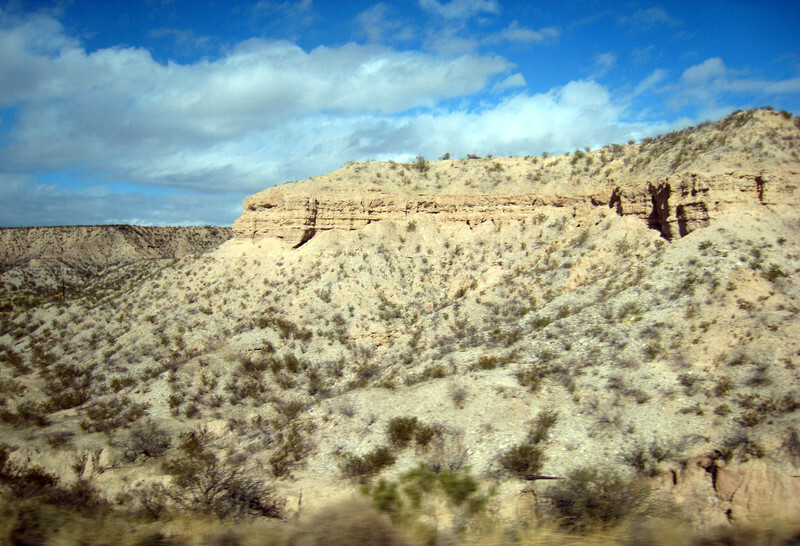 As we traveled I-10 across west Texas, the landscape changed dramatically. The live oaks and other trees became smaller and were eventually replaced by mesquite and creosote bushes and prickly pear cactus. We passed miles and miles of this landscape never seeing a house or a person and rarely grazing cattle. 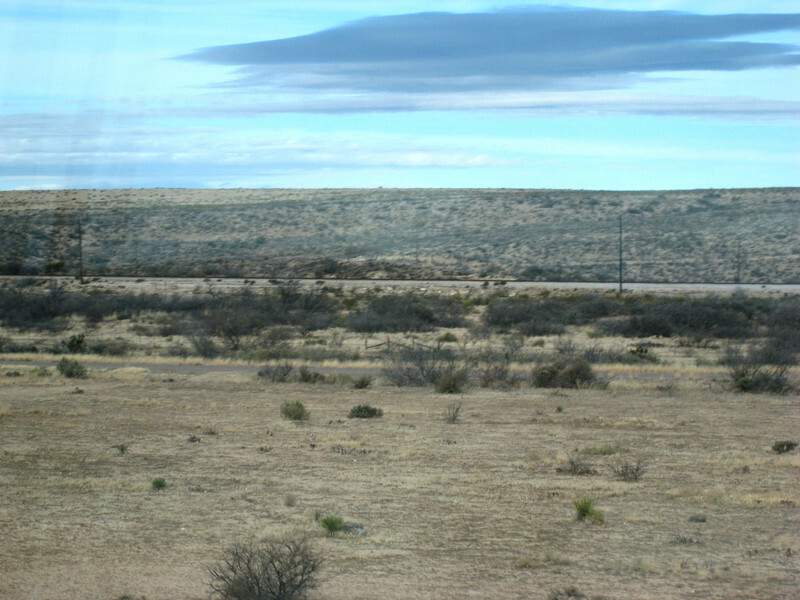 At the end of western Texas, entering New Mexico, the terrain began changing again. We were struck by these mountains rising above us. When we are traveling on successive days, we usually stay at Passport America campgrounds along the interstate that provide pull-through sites. These are very convenient, but not too quiet., so we were delighted to find Caverns of Sonora. Located six miles from the interstate and situated in the heart of a ranch, there was an RV park in addition to the caverns. Unfortunately, I was not able to take the cavern tour. The sign in the office said there were 360 steps on the tour and 1 3/4 hours of walking. That's more than my knees can handle. However, the wildlife and quiet in the area was amazing! As we continued across New Mexico and into Arizona, the changing landscape continued to enthrall us. Driving through Phoenix on a Saturday proved to be a challenge as the road seemed inadequate for the amount of traffic. However, as we pulled into Saddle Mountain RV Park (a Passport America campground) in the setting sun, we were rewarded with the changing colors on the mountains surrounding the campground. While staying at Saddle Mountain, we took a day trip to Wickenburg, AZ . This town deserves more than a couple of hours to explore so this trip we reconnoitered for a more in-depth visit in the future. Located on the northern edge of the Sonoran Desert, we were captivated with the colors and textures of the vegetation and the beauty of the mountains. We'll sure to be back to visit the Hassayampa River Preserve, Desert Caballeros Western Museum, and Vulture Mine which is an abandoned gold mine. Wickenburg is also home to Rumuda Ranch offers biblically-based residential programs for women and girls suffering from eating disorders and related issues. Although we've had two nights in the 20s, we did miss lows in the teens as we had hoped. 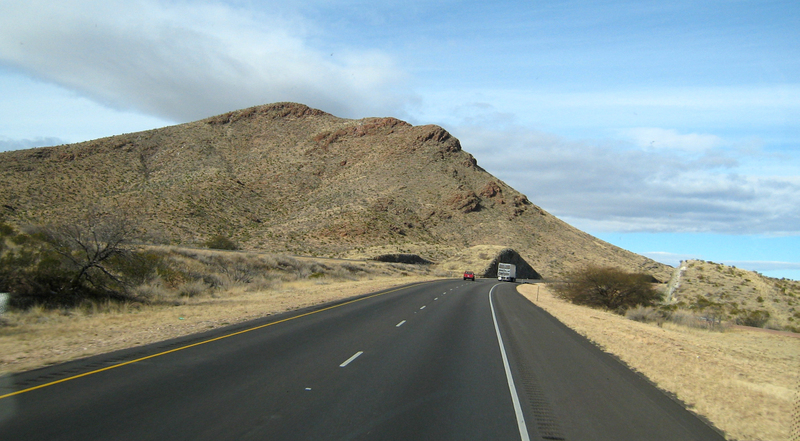 Thursday we travel the 70 miles to begin our Quartzsite stay. This will include self-sufficient camping in the desert…meaning without any hookups. We will depend on our water tanks, generator, and batteries to provide us with electricity and heat. Conservation will be the word of the day. We look forward to sharing with you our Quartzsite experience.